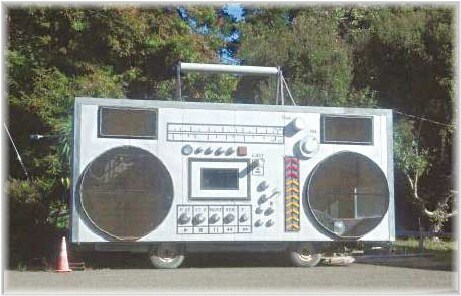 In California, an amateur artist redesign and transform his car into big giant radio set. At first glance it seems a scene of film. It is 24 ft long and 37 ft tall, and yet this is the world biggest custom made radio car. The owner shows all features which are normally presents in all past radio set including; radio dial with an old style tuner and stations, volume dial, frequency setting options, left right two big speakers, grip handle on top, etc. At a time at-least five people can ride comfortably and can enjoy music and do party in this mobile car in no cost. Because of its box shape and features people reward it name of RockBox Radio Car.